As you can see, it seems the Mockingbird Fake News swept this misspelling under the rug. But there is more. The tweet reads: ‘they no longer care about our Countrty’. 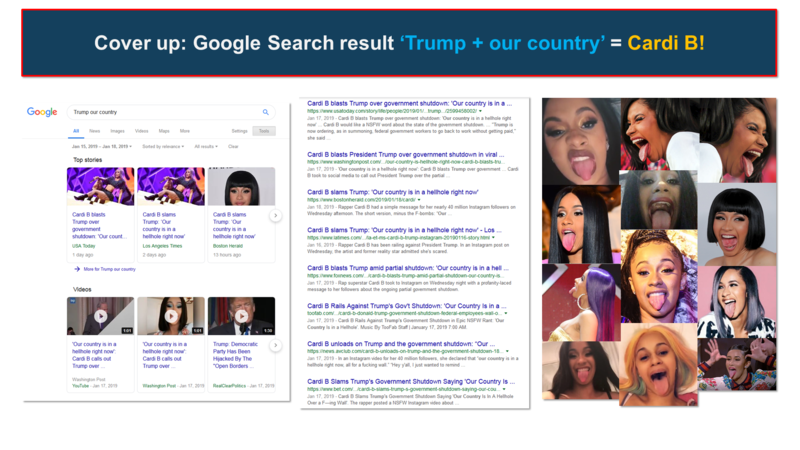 Suppose you vaguely recall there was ‘our Country’ in the tweet and Google search with ‘Trump+our country’ within the last 3 days. This is what you get: Img2PNG Hahaha! Thank you Google! We have a situation at the border, the Government is shut down, thousands of people are not getting paid but if the world wants to know what is going on with Trump and our Country, they will have to rely on Cardi B’s expertise! This is what they do. When they are afraid of certain search combinations and want to bury a particular result, they activate one of their assets or anyone they control indirectly and make him/her say the ‘flooding’ keywords in a staged interview. Once it’s in the bank, it’s distributed to the media network for headlines and the final move is to put it on top of all search results. Why did they bury this misspelling? Why did they avoid mocking Trump the way they usually do? Why are they so afraid of this extra T? It’s because the secret it reveals is explosive. Yes, explosive. The day prior to this tweet, on Wednesday January 16 2019, a Georgia man under the name of Hasher Taheb, 21, was arrested for plotting to blow up the White House: - video - Reuters article. As you can see, his last name starts with a T and our tweet has an extra T. Coincidence? I will show you it’s not and this attempted attack on the White House is exactly what the Maestro is hinting at. As usual, let’s extract the key the Maestro used for the perturbation of Country to get Countrty. Img3PNG The Y=25 is transformed to a T=20 by moving 21 steps forward in the alphabet or 5 steps backwards. The space after the Y, which is zero, becomes a Y=25 by moving 25 steps forward or 1 step backwards. You get the 2 keys [UY] and [EA]. What is [EA]? Peruvian Coffee for those who answered Q1559 and saw the Viv[a] L[e] Resistance network! Every time you see the Maestro make a play with the letters A and E, you should know he is referring to this JC-LP-PS network hidden in JC’s old FBI that I told you about and that the subject is about Presidential Assassination attempts. Check this post in AW9's archive to know more about this network. Comey is now pulled in. In the Reuters article, FBI Special Agent Tyler Krueger informs us that Taheb, 21, planned to use an , blow a hole in the White House and, with his group, take down as many people as they possibly could. Now look at the perturbation zone in the picture, if you notice in the second row that 25-21=4, you will enjoy how Taheb’s age and the AT4 are beautifully coded in the grid. Let’s extract more by bringing in the 2 following tweets. Img4PNG We have 3 timestamps: 9:04, 10:04 and 9:40 for the retweet. Do you see a pattern? Do you see this moving 4? The Maestro is insisting on the number 4. The second tweet timestamp is 10:04. Let’s go to Q1004. It’s a security test and it says ACTIVATE D-PRIV. Since D=4, the private relevancy of this number 4 is confirmed. What can it represent? We’ll get back to it. Following the 9:40 retweet, let’s go to Q940. ANTIFA is pulled in. Coincidence? No. They are related to the sleeper cell network. Since Comey and Antifa are pulled in, let’s go to Q645. 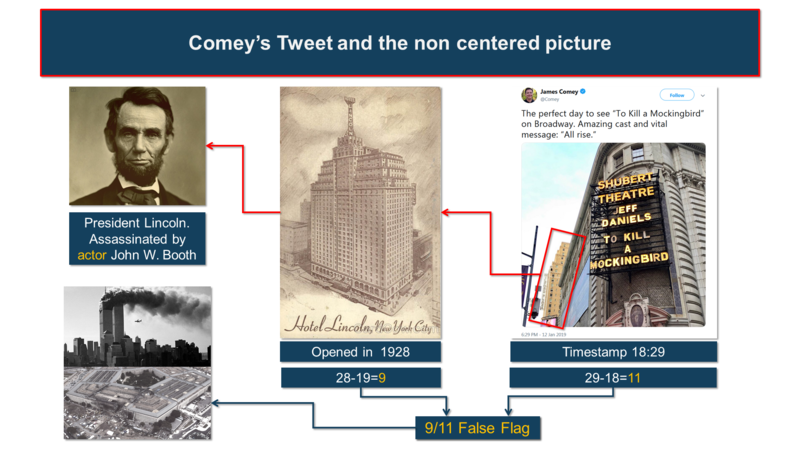 Img5PNG In this drop, Q teaches us how to read Comey’s tweets and gives us the very important information that Comey controls sleeper cells throughout the country and can activate them using coded language in his tweets. This in itself is pretty explosive right? A man (Taheb) who planned to attack the White House with explosives and an anti-tank rocket today is under arrest, federal prosecutors said. Taheb allegedly told an undercover FBI agent in December he wanted to attack "the Washington Monument, the White House, the Lincoln Memorial, and a specific synagogue." CBS News. Let’s now analyze the capital letters of the Countrty tweet: TLTRC=73. Same value as UNION=73. Country? Union? Do you see it? What number is relevantly associated with each State in the Country? Yes, the number that corresponds to the order in which a State joined the Union. Where was Taheb located? In Georgia. And Georgia was the 4th State to join the Union. This is the explanation for our mysterious moving 4! This was the last clue the Maestro gave us to confirm this countrty tweet was indeed about Taheb, his arrest in Georgia, Comey’s involvement in the activation of the 9/11 sleeper cell and its connection with ANTIFA. The Day has come to activate the sleeper cells that did the job on 9/11 and to perform attacks targeting high profile buildings on American soil and the White House in particular. Perhaps our Amazing cast will be as successful at getting Trump as the actor John W. Booth was at delivering Lincoln’s vital message. Nancy? She’s the smart one of the group. The wrap up smear expert. She has a bag with many little tricks but has no clue a chess board is made of 64 squares. The way she managed the Maestro’s offer to support her Speakership was the proof she does not see the big picture… In the morning of Jan 16 2019, she wrote to POTUS and positioned on the political timeline that she was worried about the impact of the shutdown on Government security link. Pretty cool right? If a false flag targeting POTUS or Government buildings were to happen later, this letter would become political gold. She wrote it on the 26th day of the shutdown. Why wait all this time? It was time to stop whatever was being prepared. Taheb got arrested the same day, a few hours later. He confessed he was going to make his move the next day. At this point, who do you think is a better singer? Cardi B or Taheb?